Notre Dame started slowly against Michigan State, but picked things up at the midpoint of the first quarter to outscore MSU 46-20 over the next fifteen minutes to take a 52-26 lead at the half. The score was tied at 6 until Brianna Turner scored four minutes into the game to give the Irish a lead they would never relinquish. Notre Dame made just 4 of its first 14 shots before the first quarter media timeout. The Irish made 17 of 28 (60.7%) the rest of the half. Turner, Jess Shepard and Jackie Young dominated the paint — combining for 21 of ND’s 25 first quarter points along with 14 rebounds before adding 14 points and 9 rebounds in the second. The Irish outscored the Spartans in the paint 32-12 in the first half. Arike Ogunbowale only had two points in the first quarter on 1 for 5 shooting before erupting for 11 points in the second quarter. For the night, she again led the Irish in scoring with 23 points including 2 of 4 on her three-point attempts. She also had five assists on the night. She passed 2,500 career points in the second quarter and her Notre Dame record now stands at 2,517. Young chipped in with 21 points, 11 rebounds and 7 assists in just 29 minutes of action. She ended three assists short of her third triple-double of the year. 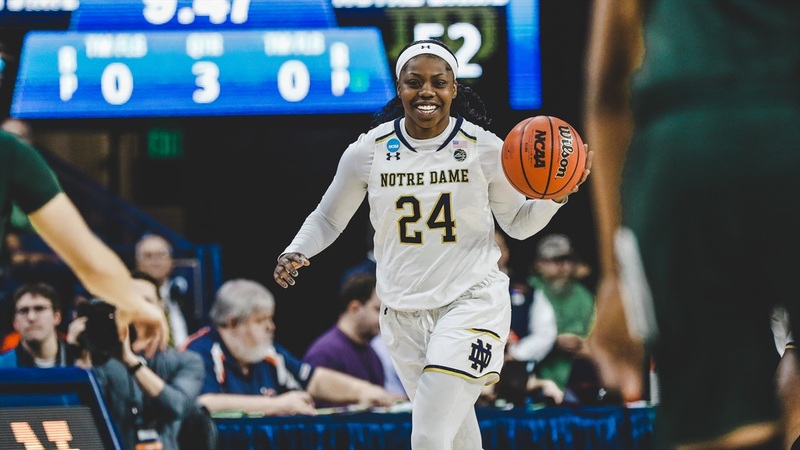 Others are starting to notice what Irish head coach Muffet McGraw has maintained about Young’s versatility and overall game. Shepard only played 25 minutes, but she was able to score 19 points, collect 9 rebounds, 2 assists, 3 steals and a block. Turner only took seven shots, but made 5 and went 4 for 5 from the line to score 14 points. Her 11 rebounds gave her the all-time record at Notre Dame. Her 1,010 career boards are three better than Ruth Riley. Turner added four more blocks to her career total, which now stands at 359 — just 11 shy of Riley’s record of 370. Marina Mabrey had a second straight off shooting night — making just 1 of 6 shots for two points. She was 0 for 4 from three. She did play without the knee sleeve she wore in the last game after hyper-extending her knee last week. The injury kept her out of practice for most of the week. She did have four assists, and two were perfect on-time passes on the break. Notre Dame’s defense limited Michigan State to 10 of 34 shooting in the first half (29.4%). The Spartans had a better second half, but the Irish still extended the 26 point half time lead to 34 points before all the starters were pulled at the mid-point of the fourth quarter with the score at 85 to 53. The Irish scored 52 points-in-the-paint to 34 for Michigan State. Notre Dame won the rebounding battle 49 to 37. The Irish collected 16 offensive rebounds leading to a 15 to 8 edge in second-chance points. ND had 20 assists and 11 turnovers — the starters only committed five of the giveaways. Notre Dame only had one solid shooting quarter, but it was the second when the Irish hit 11 of 19 shots to build the 26 point half time lead. For the game, the Irish only shot 47.9% from the field, but they still managed to top 90 points for the tenth time in past eleven games. The Irish will make the short trip to Chicago this weekend and a Sweet Sixteen match-up with Texas A&M on Saturday. The Irish will have their hands full with a team they beat by six points in the Sweet Sixteen last season.